So far this season the Jays have been a force to be reckoned with leading the AL East going into today by 2 games over both the Red Sox and Yankees. Adam Lind has fallen into the DH role, and part of the reason they have been scoring so many runs. Lind is batting .333 with 3 HR's and 15 RBI's. If someone said a year ago that he would be putting up these numbers within a year, I probably would have laughed. Despite him being pegged as a power hitter, his first call up was a meager display of power. Towards the end of last season he showed more of a spark, so maybe this is the player that the Blue Jays knew he could be and would be eventually. 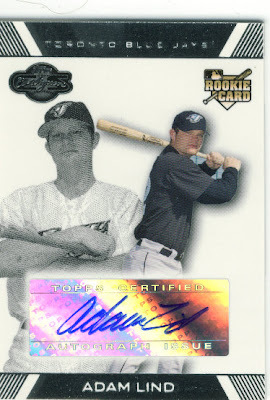 Now you know I am not going to write a blog about the Blue Jays or Adam Lind without anything to show for it. They aren't some of the better cards of his out there, but these were the most budget friendly right now and I didn't have them. 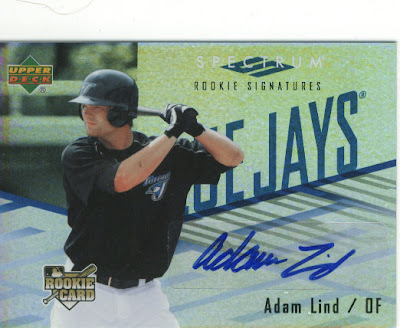 If anyone has any Lind cards to trade, please let me know. 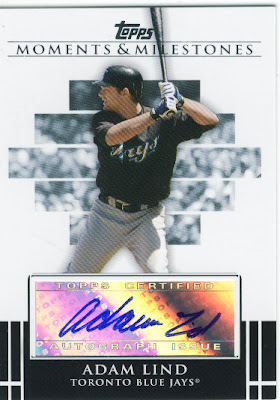 I am missing some 2004 cards that I would like to get my mitts on. Those Lind cards are amazing. 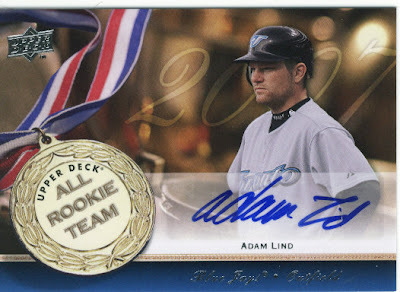 I am a huge Jays fan and if i get any Lind doubles, you will be on the top of my list. YES!!! It's nice to see Toronto in First and it's nice to see someone lovin the Adam Lind!